NHL and NFL All-Star games were last weekend (anyone watch?). That marks the start of the second half of the NHL season and we've got two new NHL pools to join, pick'em and survivor. One final football game this Sunday. It is sort of a big one, Rams versus Patriots. Our NFL Playoffs pools wrap up and my annual Super Bowl Party Quiz is now available. Time to crown new (or repeat) NHL pick'em and survivor champs. A new feature makes it easy for our private pool players to join and play by copying their weekly picks to the free pool. These start Saturday. Bragging rights on the line! Pick the winner of every game on the Saturday NHL schedule. Free to enter. Limit 1 entry per member. Pick one team to win from the Saturday schedule. Cannot pick the same team twice. 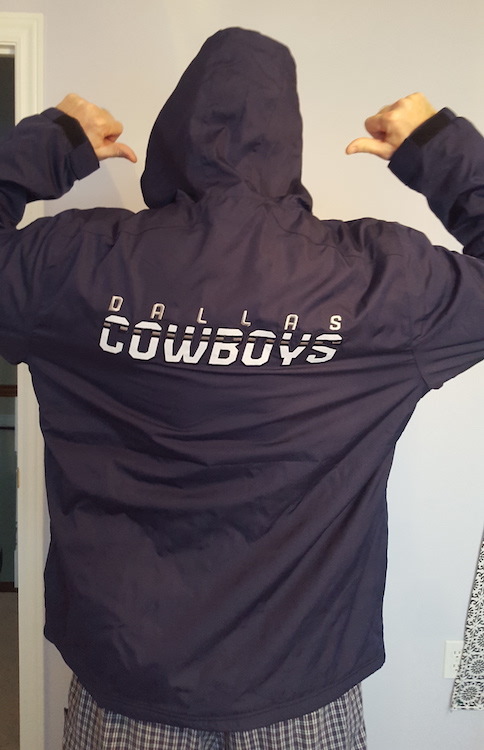 It looks like it will be one of members Capeislander (Patriots) and The_Germanator_87 (Rams) to win this Dallas Cowboys jacket from our NFL Playoffs pool. Final results for all NFL Playoffs pools posted late Sunday, and emailed Monday. Watching The Big Game™ Sunday? In that case you'll want my Super Bowl Party Quiz. It is 30 multiple choice questions including the coin toss, U.S. National Anthem and first animal to appear in a commercial after kickoff (gotta be dog). Even some questions about the game itself. Download the PDF at sister website Draft Buddy. Thanks for your time. See you in the hockey pools!